Romeo Langford hit a go-ahead 3-pointer early in overtime and Indiana ended a seven-game skid, taking advantage of No. 6 Michigan State's poor foul shooting for a 79-75 victory Saturday. 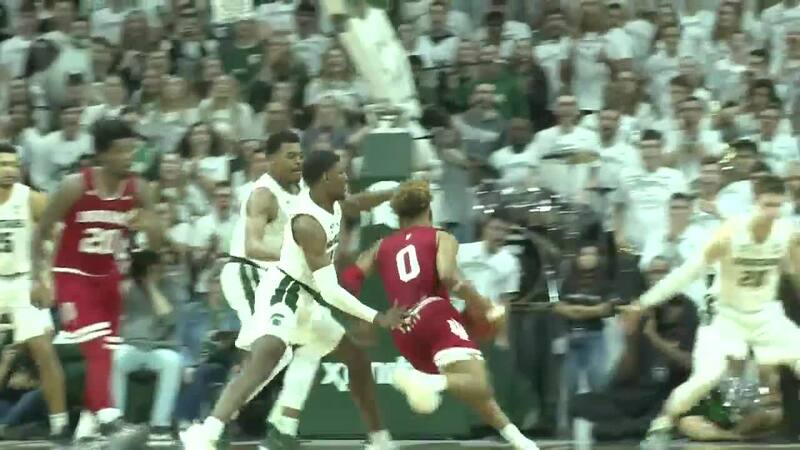 EAST LANSING, Mich. (AP) -- Romeo Langford hit a go-ahead 3-pointer early in overtime and Indiana ended a seven-game skid, taking advantage of No. 6 Michigan State's poor foul shooting for a 79-75 victory Saturday. The banged-up Hoosiers (13-9, 4-7 Big Ten) stopped their longest losing streak in nearly eight years. Already minus ailing forward Zach McRoberts, they lost star forward Juwan Morgan to a shoulder injury in the first half. The Spartans (18-4, 9-2) have dropped two straight for the first time this season. Michigan State doomed its chances to win at the line, making just 8 of 22 free throws. Michigan State trailed by one with 18 seconds left in regulation before Nick Ward made one of two free throws. He finished 1 of 9 at the line. Langford scored 19 points, including his 3 that put the Hoosiers ahead with 3:13 left in OT. Al Durham added 14 and Justin Smith had 13 points along with three blocks. De'Ron Davis had 12 points for Indiana and Devonte Green scored 11, returning from injuries for the first time since playing Jan. 19 at Purdue. Michigan State: Tom Izzo's team had been winning without Joshua Langford, but they are starting to struggle offensively without the shooting guard. The Spartans made just 33 percent of their shots in overtime and made 45 percent overall.